This uniquely and special designed Rhombicuboctahedron style Star of David necklace. The Kabbalah calls this "The Merkaba". The combination of of the solid structure of the Rhombicuboctahedron with the powerful meaning and symbol of the Star of David is making this necklace to be a most powerful gift. The Star of David or Shield of David is a generally recognized symbol of Jewish identity and Judaism. It is named after King David of ancient Israel; and its earliest known communal usage began in the Middle Ages, alongside the more ancient symbol of the menorah. Geometrically it is the hexagram. With the establishment of the State of Israel in 1948 the Star of David on the Flag of Israel has also become a symbol of Israel. The symbol is also associated with the Zionism movement. 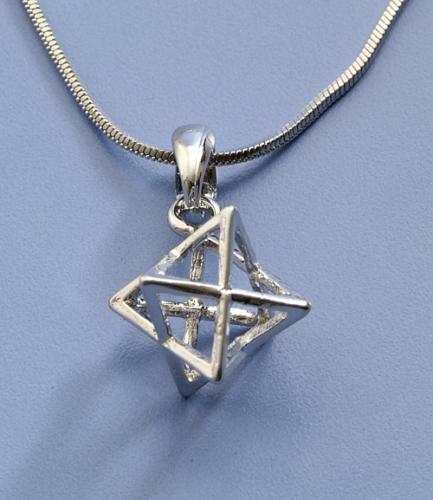 This necklace contains both biblical and Kabbalistic features. Use this gift wisely.